Now you would be forgiven for thinking that my earlier story about my experience at Bo Innovation abruptly ended there (and yes it has possibly been the longest article I have ever written and it has taken me months to finish the follow-up piece), but we’re not quite done yet! Having been carrying a Partagas Serie E No. 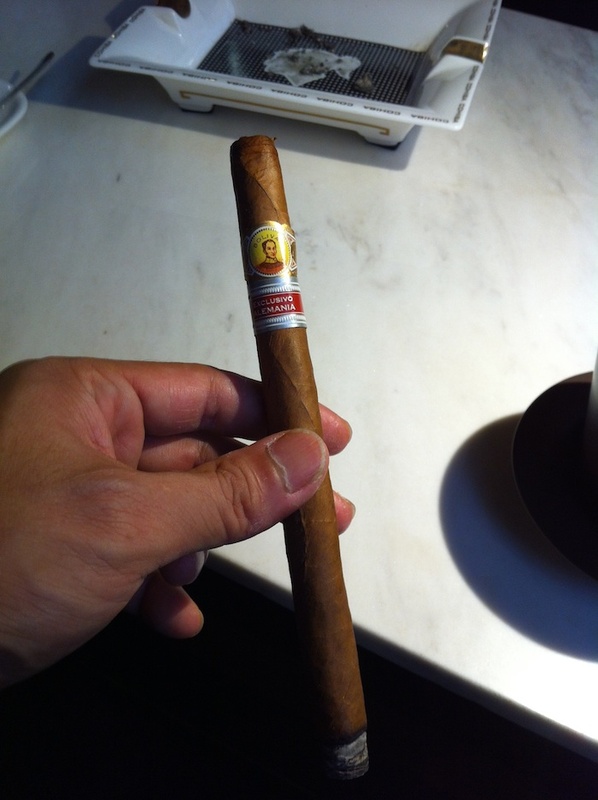 2 (kind of like a double-length Partagas Serie D No. 4), I remembered the fellow smoking a cigar on the terrace, and decided to follow suit – there’s nothing like lighting up a quality stogie to round off a sublime meal. As I sat down at a table outside, the Maître D informed me that the chap whom I saw as I walked in (and he was now having a meeting with a couple of people) is in fact the Demon Chef, and politely inquired if I would like my menu autographed. Back home in Australia, we’re extremely laissez faire when it comes to these things, and I didn’t really want to bother him, thinking that he was busy and had better things to do than to talk to some random punter like me. But I of course politely said yes, thinking to get the autograph and then settle in at my own outdoor table with my very special E2. When we got to his table, Alvin said that he was finishing his meeting shortly, and would then attend to the autographing. I thought “that’s fine, no dramas”, and went back to my table and lit up my ultra-fine piece of Habanos (you can tell I really dig this stogie don’t you? 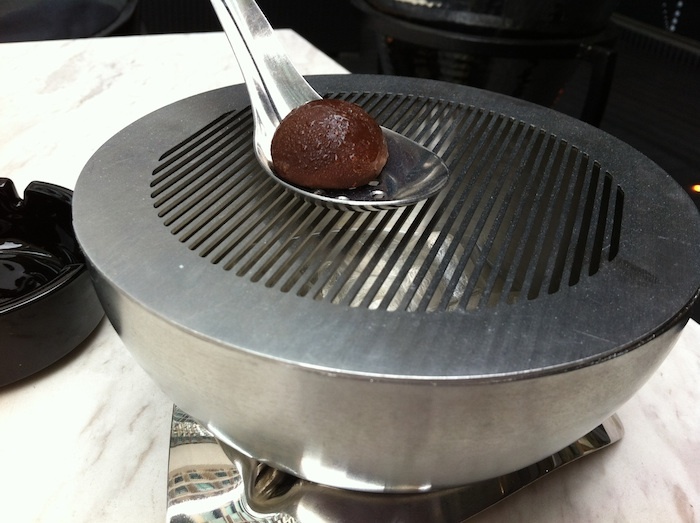 But how could I not, with its smooth, spicy aroma, milky rich/soft smoke sporting cacao and leather flavours). 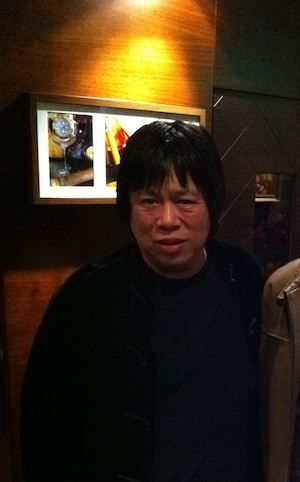 Next thing I know, Alvin pulls up a chair at my table and introduces himself. He then pulls out his own Cuban beauty (a Bolivar Belicoso if I remember correctly) and proceeds to light it, and we start chatting. We chatted about his career, his philosophy on food, his cooking and about life in general. This is a man who is extremely driven, full of ideas, and it was certainly inspiring to hear about his outlook on life. Did you know that he’s a self-taught chef? Other than Heston Blumenthal, he is the only other self-taught chef in the world to have won 2 Michelin Stars. But that’s not enough. We spoke about the TV show he was working on (he was writing episode ideas and treatments while I was enjoying my degustatory experience), and was unabashed about wanting to earn a third Michelin star. 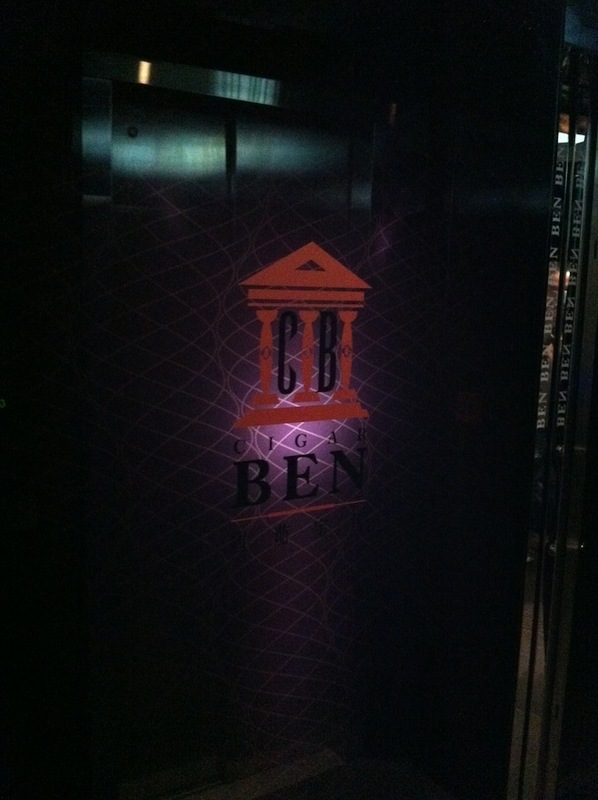 He also has a share in a members-only cigar lounge called Cigar Ben on Hong Kong Island (where we caught up a few times over the next couple of days for a civilised cigar and whisky, and more conversation). Now that is the life! He has a refreshingly unique take on fine dining. As I had observed, and he confirmed, most of his dishes had their origins in Chinese cuisine – not the style that is more prevalent in Australia, where “Asian fusion” is almost synonymous with South East Asian-influenced flavours and cooking, in particular Thai cuisine. Alvin is also a generous man – as we started chatting, he had a second dessert brought out for me to try. And as we chatted about the lack of availability of old school caviar from Mother Russia, and the merits of caviar now farmed in other places, such as California and even China. 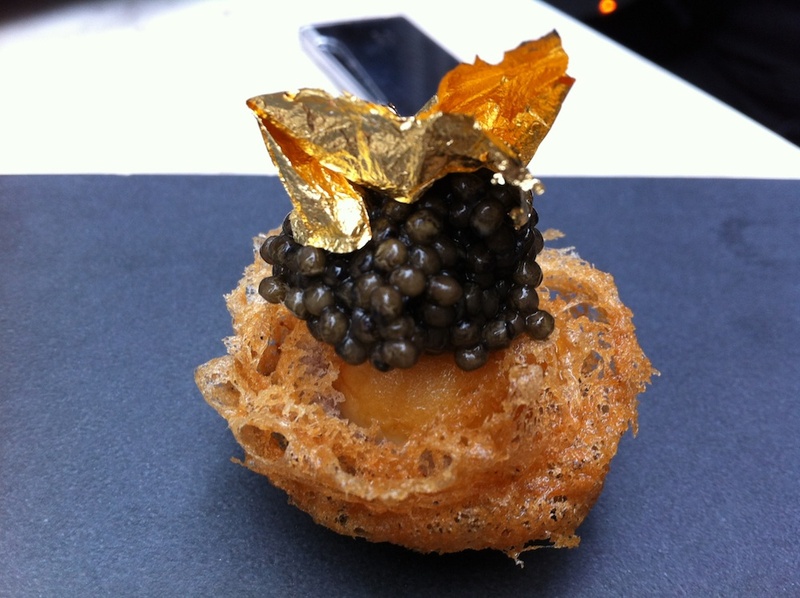 Alvin was adamant that the quality of Chinese caviar was unparalleled outside of Russia, and to demonstrate his point, arranged for a beautiful little morsel to be served to me – reminiscent of a dim sum-style deep fried yam ball (but delicately light in texture and flavour and not oily at oil) topped with gold leaf and Chinese sevruga caviar. Both were delicious indeed! His generosity didn’t stop there. 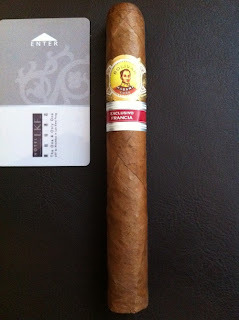 Upon discovering a fellow cigar aficionado, he insisted on gifting some rare and fine sticks to me, including a limited edition Bolivar Libertador made exclusively for the French market, a long panatela-sized 2009 Bolivar Especiales No. 2 Exclusivo Alemania, and a Cohiba 1966. I only discovered much later that the Bolivar Libertador was 2007 production of only 2,400 boxes, and was a sublime size of 54 ring gauge and 6.5 inches in length (incidentally, the original Cohiba Sublime is my favourite all-time cigar ever, over and above the 1973 Romeo y Julieta Churchill I enjoyed at Claridge’s just before the UK’s indoor smoking ban was introduced, and the Bolivar Coronas Gigantes which were made in the 1960s which my cuzzy bro DDski found at a deceased estate auction). Thank you my friend. Since the Demon Chef and I caught up, I’ve learned that he has opened a restaurant in London, which one of my old school mates Simo enjoyed as part of his “farewell tour” (in the parlance of his investment banking colleagues), and his TV show The Maverick Chef has just recently kicked off. What an amazing, enriching and uplifting experience. I am going back to Bo Innovation soon – in fact, I’ve already booked it in. Simo is also coming along, in a quest to achieve the Bo Innovation quinella experience.